Photograph: Michael Juliano Devil's Gate Dam. I just assumed this kid asking for directions was messing with me. This was, after all, innocuous Pasadena, home of the first Trader Joe’s, the Rose Parade and that Jan and Dean song. But a few quick Google searches later, and there it was: Devil’s Gate, a craggy profile of Satan naturally chiseled into an outcropping on the Arroyo Seco. 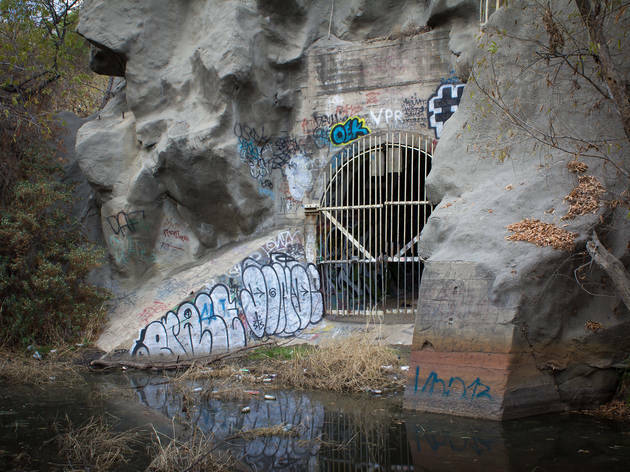 Here are the only facts you need to know: Devil’s Gate lent its name to a nearby dam and gated channel, constructed in 1920 to control the now feeble flood waters from the San Gabriel Mountains. But fall down the rabbit hole of paranormal enthusiast websites and you’ll find a few common threads involving Aleister Crowley (infamous occultist), L. Ron Hubbard (infamous Scientologist) and Jack Parsons (infamous JPL co-founder), as well as mentions of Native American lore, “moonchild” rituals and the Seven Gates of Hell. I’m a skeptic, if not an outright denier, when it comes to the occult. So I have no idea what possessed me one cloudy afternoon to explore Devil’s Gate alone. Not wanting to sway my already low expectations, I figured the less I knew about what to expect, the better—literally the worst advice for going on a hike. The trail starts at the end of La Canada Verdugo Road, a perfectly pleasant cul-de-sac that gives way to a bleak path across the dam. I’m already feeling silly at this point: There’s nothing more than a dried up river bed and some majestic concrete arches. You can even see the top of the so-called Satanic rock from the top of the dam—no black clouds, no swarms of bats, no billowing fireballs. The scariest thing so far is a slight chance of rain and a single piece of graffiti that looks somewhere between an alchemy rune and the Eye of Sauron. I decide to press on anyway, through a tunnel, down a dirt path and into a clearing with an abandoned shack, overtaken by unkempt brush and adorned by a faded “danger” sign. I make my way through the woods, growing a little bit sweatier with every step and each audible rustle in the bushes. I thought I should’ve been to the rock at this point, but instead I'm standing underneath the 210, staring down the illustration of a slobbering, empty-eyed face. I quicken my pace and follow the sound of trickling water, until, at last, I come face to face with...Brookside Golf Course? See, I took a wrong turn at the bottom of the hill. Devil’s Gate, it turns out, had only been a few steps away through a thicket of trees; I had instead been heading in the opposite direction, toward the decidedly unspooky overflow parking lot for the Rose Bowl. It wasn't any paranormal power that put me on edge, but the fact that it had been so easy to feel so alone and vulnerable. It’s unsettling to wander aimlessly through LA’s seemingly uncharted wastelands—seriously, try driving through Vernon or Commerce without a GPS. With the little bit of tension snapped, I unceremoniously make my way back toward the real Devil’s Gate. And just like that, there it was, with nary a dark specter to trumpet my arrival. The rock really does look like Satan: protruding chin, pointy noise, stern eye socket, stumpy horn. 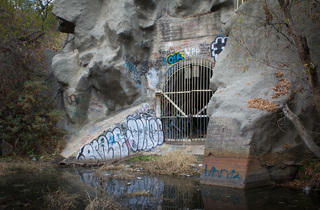 I stare down the gated tunnel at its base, half expecting a gnarled, old crackhead to crawl out. But nothing happens. Moreover, I don’t feel anything out of the ordinary, other than the disappointment that I'm surrounded by a patchwork of sloppy graffiti and a floating collection of discarded spray paint cans. On my list of alarming forces in LA, Devil’s Gate lags far behind earthquakes, wildfires and the Santa Ana winds. That said, you’ll never catch me there at night—and certainly not alone again. Make sure to check out the rest of our photos of Devil's Gate and explore more haunted places in LA, including the haunted houses that spring up around the city this time of year.